Whether it’s alone, with friends or family, vacations are marvelous for so many reasons. It gives you the opportunity to visit someplace new, see the sites or simply recharge your batteries. Unfortunately, much work must be done before vacation begins. That’s why the vacation travel checklist was created. With the vacation travel checklist, you will be able to keep track of all that needs to be done so you can truly enjoy your time away from home. The vacation travel checklist also helps you save a little extra money for your trip. You can download and print off the Microsoft vacation travel checklist for free. Simply click the download link to begin today! 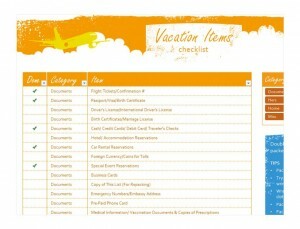 The vacation travel checklist is a beautifully designed Excel template from Microsoft. In addition to the checklist, the template provides packing tips, such as packing fragile items in the interior of the luggage, packing day items separately, and wrapping shoes in plastic bags so they don’t leave marks on clothing. The vacation travel checklist comes formatted with a wide range of items included. In all likelihood, you won’t need every single one of them included on your vacation travel checklist. The template can be edited to your liking with just a few clicks, so feel free to make any changes that would make the template more helpful. The “Item” category is where you will find items you need to purchase or tasks you need to complete before you begin your vacation. The “Category” area separates items so that the checklist is easier to read. Once a task has been completed or an item has been purchased, a green check mark will appear in the “Done” category. Before you leave for your next vacation, download the vacation travel checklist. Get it and print it for free courtesy of ChecklistTemplate.net!